As a postscript to last weekend’s post, I finally managed to finish relocating my soft fruit to the raised beds with a view to downsizing to half a plot next year. I’d already managed to layer a couple of my gooseberry and blackcurrant plants where the laden branches had touched the soil and put down good little root systems. The raspberries are always prolific suckerers, so it was an easy task to dig up some new suckers, both autumn and summer varieties, and plant them in rows in one of the designated new fruit beds. I’d moved both the early and late rhubarb a few weeks ago, but shared more of my existing mammoth clumps with a fellow plotholder who wanted a more vigorous variety. Mine is certainly that – I’ve had to advertise it to friends on Facebook the last few years as I’ve been so inundated! Preheat the oven to 180°C, gas 4. To make the shortbread, mix the butter, flour, cornflour and icing sugar together in a food processor or by hand if you prefer. When it comes together to form a dough, press evenly into the tin, prick with a fork and cook for 15-20 mins until starting to look pale golden brown. Combine all the topping ingredients in a bowl and pour onto base. Return to oven and cook for 35-40 mins until the top is set and golden brown. 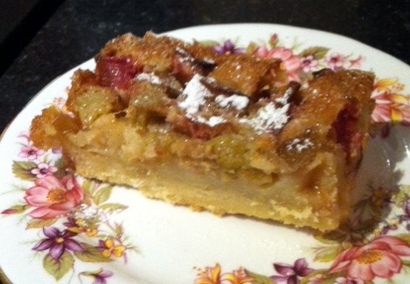 Allow to cool, then cut into squares or bars and dust with icing sugar just before serving. Serve warm as pudding with cream or crème fraiche, or just with a mug of tea and a delirious grin for afternoon tea! A very enjoyable afternoon down at the allotment today after missing out last weekend due to gardening duties at home! Hard to know which to favour, but I figure that I see the home garden more (especially from my study window whilst I’m working), so I do like it to look nice. 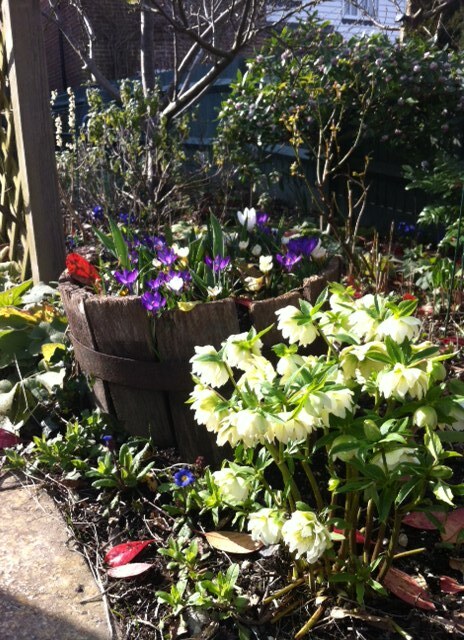 Last weekend’s job was to distribute the compost around the plants that needed it the most – there’s never enough to go round everything, small garden or not! I have two of those “Dalek” compost bins hidden away behind my garage and work on a rotational basis: one is filled whilst the other rots down for a year, then in early Spring I empty the well-rotted bin and start again. I also have a couple of smaller overflow bins close to the back door (one an old wormery, the other a 50 l plastic container I used to use for recycling before the council decided to collect all our recyclable waste in a separate wheelie bin). It’s quite a trek to the garage on the opposite side of my driveway, so it’s handy to be able to empty the compost into the closer bins on a daily basis, then I tip these into the bigger bins periodically – trying not to leave it too long as they get VERY heavy. Both of them have drainage holes, which helps, and I suppose it serves the additional purpose of rotating the compost when it’s tipped out. It amazes me how much compostable stuff you accrue in the kitchen each day – I have one of those plastic cutlery drainers (without the dividers) in my half-sink, which I means I can empty my teapot (loose-leaf tea) straight into there, and of course all the peelings and vegetable waste, flower stalks, etc. Mine must get emptied at least once a day, more in summer or if I’m making juice. You can get those neat little crock pots with charcoal filters from places like Lakeland, but that wouldn’t be any use for draining tea – and mine is emptied so often that smells aren’t an issue. In my previous 2-acre garden, I had two massive compost bays each the size of a small car, and the compost was to die for as it had been accumulating for so many years – helped by the vast expanse of lawn to mow with the ride-on mower and resulting grass clippings! My boys were young teenagers at the time and took great pleasure in mowing the lawn (perhaps that’s why they both passed their driving test first time?!) on the tractor mower, with the ability to turn it on a sixpence – unlike their mother…. Needless to say, one of the few things I took with me when leaving that garden was several bags of rich, crumbly compost to start the blank canvas that was to become my current garden. I have two small compost bays made from pallets down at the allotments, again working on the rotational basis, but now sadly in need of repair as they’ve been there 7 or 8 years. Another plotholder (and fellow dance class attendee!) has kindly let me have a few spare pallets and suggested cable ties to attach them together, rather than nails. That will have to be next weekend’s job now, as it’s Mother’s Day tomorrow, but I look forward to seeing whether that works. The main beneficiaries of the resulting black magic tend to be any new plants/shrubs and anywhere I’ve created new beds and our sticky Wadhurst clay is still to the fore. You can sometimes see little brandling worms in the compost when you dig it out and I swear you can hear the plants sighing with pleasure as you spread it around. 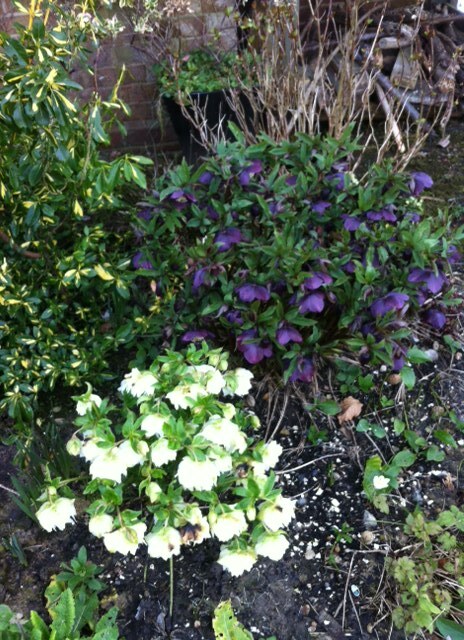 It certainly looks fabulous to see all those new spring shoots surrounded by dark crumbly compost. A very satisfying – if exhausting – task! It had been my intention to go down to the allotment after finishing mid-afternoon, but an unexpected and nonetheless welcome invitation to afternoon tea put paid to that, so I ended up dashing down in the twilight to harvest some leeks and purple-sprouting broccoli for dinner. One of the things I love most about growing my own is the challenge of returning with delicious produce and deciding what to cook: this was the result last Sunday – so simple, yet absolutely scrumptious. 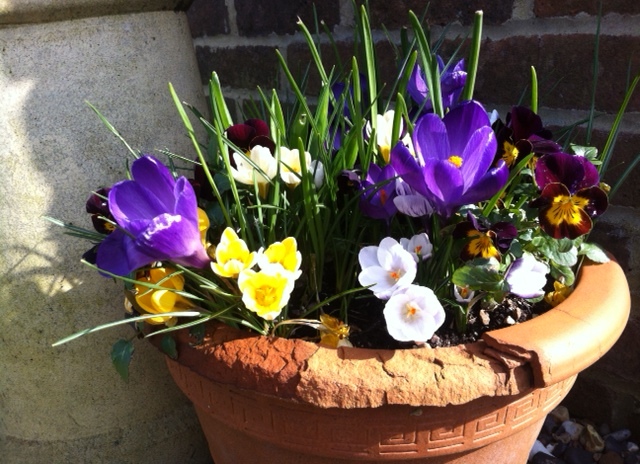 The simplest things often are the best…. Soak the sultanas in boiling water. 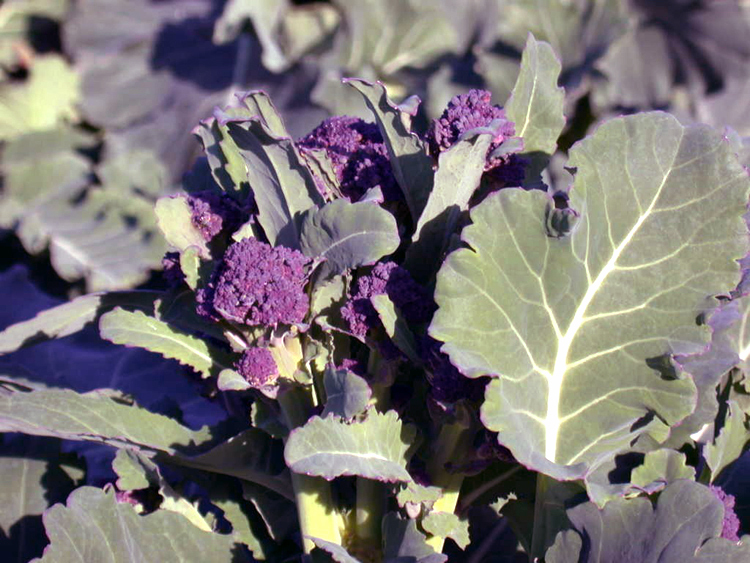 Microwave or steam the broccoli for 3-4 mins until tender – if using calabrese rather than the finer purple-sprouting broccoli, you might want to chop this into smaller florets and any thick stems into round chunks first. Drain and set aside. Cook the onion in the olive oil until soft, add the anchovies, drained sultanas, pine kernels and broccoli, stir gently, then cook gently for about 10 mins to allow the flavours to infuse. Meanwhile cook the pasta as normal, then add to the frying pan, season and serve with the grated cheese. So flavoursome, yet with such simple ingredients – enjoy! My student son is home for the weekend, back for a bit of rest and relaxation, respite from the hectic whirl of studying for finals and applying for jobs, and of course the opportunity for home cooking in a clean, warm house with Sky TV and a powerful shower. Not that he isn’t an excellent cook himself, but this weekend’s request menu featured steak – and that’s beyond the average student budget! Rhubarb crumble was also on the menu with the first of the season’s rhubarb – delicious! 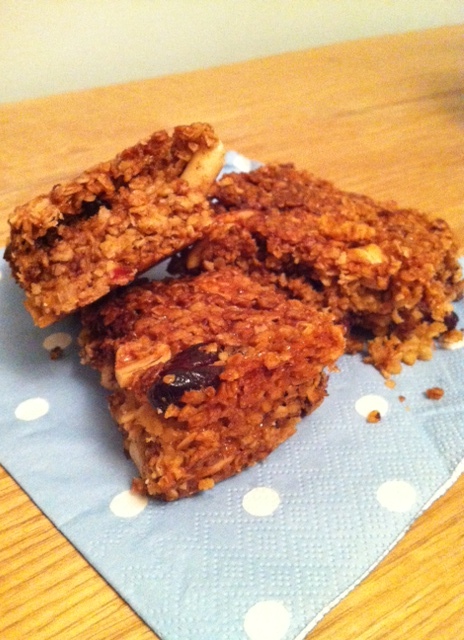 Also on the list was something to take back to university next week to sustain him through the late nights at the essay coalface, and Rocky Road Flapjack was his chosen treat. 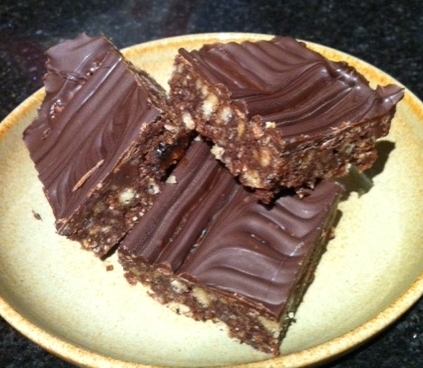 This recipe was adapted from a Waitrose Kitchen magazine special on traybakes last summer, tweaked a little, and resoundingly approved all round. Try it and see! Grease and line a deep 12” x 8” roasting tin with foil. Melt the butter, sugar and golden syrup in a large pan over a low heat. Mix in the oats, then the peanuts, cranberries and marshmallows. Roughly chop the white chocolate and mix though last of all, when the mixture has cooled slightly. Transfer to the tin and bake at 160°C (fan) / Gas 4 for 25-30 minutes until golden brown. Allow to cool completely in the tin, then cut into at least 16 squares. Serve and eat with a cup of tea, convincing yourself that something so delicious and with all those healthy ingredients (fruit, nuts, oats…) MUST be good for you…. However you ring the changes, just ENJOY! First steps towards allotment downsizing? Now that there’s just me at home most of the time, I’ve decided that a full allotment is probably somewhat excessive. Last year I had rhubarb, plums and apples coming out of my ears in the relevant seasons and the time I have available to spend up at the allotments seems to have decreased In inverse proportion to my workload! With four established apple trees and two plum trees right in the middle of my plot, a logical split halfway isn’t going to work, especially as I have my invaluable shed in amongst the trees, plus the compost heap, a cold frame, and the essential table and chairs for potting out and reviving cups of tea. The only solution, to my mind, is to give up the third at the top of my plot where I have all my fruit bushes. That section was the first bit I cultivated when I took over the plot as it already had established blackcurrant bushes in it, but they have decreased in vigour over the years, plus the whole area is infested with the dreaded couch grass. The bottom section of my plot, on the other hand, has my raised beds and the yields from this area are far superior to the yield from the top area. So much for the old guard at the allotment who are vehemently anti-raised beds, regarding them as “television gardening”! Relatively new-fangled they may be, but I find it so much more manageable to go up and know I can tackle a couple of beds, rather than the daunting task of where to start in a whole expanse of plot. Then there’s the lack of digging – hurrah! – I’m all for letting the worms do the work – and the irrefutable fact that the yields are excellent. No need to compact the soil between rows as the beds are about 4 feet wide by 10 feet long, so reachable from all sides. I’ve put black weedproof membrane down between the beds and bark chippings on top, so it’s relatively easy to maintain. The idea had been to be able to get a wheelbarrow between the beds, but the chap I hired to install the beds didn’t follow my carefully worked-out plan as accurately as I’d have liked, so it’s a bit of a squeeze in places – but just about accessible nonetheless. They’ve been in situ about 7 years now and I’m going to have to replace some of the boards this year, but am having trouble getting any used boards from my usual supplier. The prolonged wet weather has meant that many of the large projects have had scaffolding out over the winter and it’s still not been returned, so they’ve no new used boards to get rid of yet. I’ll keep trying…. The start of it all? At last! Having knocked my perennial borders in the garden at home into shape last weekend, breathing in the deliciously sweetly-scented daphnes (Jacqueline Postill and aureomarginata) as I worked, I finally managed to make it down to the allotment to start my spring clear-up, the traditional start of my allotment year. I suppose it was really a case of cutting down dead foliage from last year: the autumn rains came upon us so fast and persisted so long that I just hadn’t had chance to take down my runner bean and pea supports or finish cutting things back. No matter, now is just as good. And in the case of asparagus and dahlias, I always feel leaving the spent stems in situ over the worst of the winter protects the precious crowns and tubers underneath. The weeds are shooting fast and furious, but the soil was surprisingly crumbly and workable in my raised beds, so weeding was easy and quite pleasurable – especially after weeks of not being able to get out in the garden at all…. The badger-ravaged sweetcorn stems finally came out today too, and all the woody material and pernicious perennial weeds like couch grass, buttercups and dandelions went straight up to the allotment bonfire heap for burning. I cut back my autumn raspberry canes too (Autumn Bliss and Joan J), a job which should ideally have been done last month, but never happened – too many family birthdays and celebrations on the few sunny days! The early rhubarb is looking very promising, but I think I’ll wait another week before I try my first taste of the year. My autumn-sown broad beans (Aquadulce Claudia – what else?) are looking good, but I filled in the few gaps there were with a spring-sown variety, De Monica, which extends the season a little, although I never find the later-sown ones do as well as the delicious November-sown crop. My raised beds have been in situ for 6-7 years now and some of the boards are starting to rot. I definitely need to contact my local scaffolding company and see if I can arrange a delivery of more used boards before the growing season really begins in earnest. Other plotholders have also expressed an interest, so I’m hoping we can combine our orders and save on delivery. My couple of hours down on the plot flew by – and I still had time for the inevitable and enjoyable chat with fellow allotmenteers: such a sociable pursuit! I had to leave time to walk the dogs before darkness descended, though, so I downed tools, tired but very content, at 5 o’clock and returned home with a highly satisfactory haul of leeks, parsnips, purple-sprouting broccoli and a bunch of daffodils just starting to show their golden yellow. 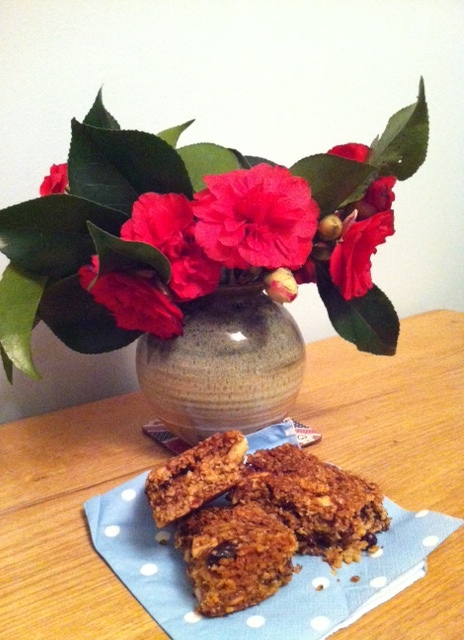 Time for a cup of tea and a well-deserved piece of tiffin, I think. Melt all ingredients apart from the biscuits and chocolate in a saucepan. Crush the biscuits finely in a polythene bag with a rolling pin and stir into the mixture. Spread into a shallow, 7” square tin (lined with foil for ease) and chill in fridge for a couple of hours. Melt chocolate in a bowl in the microwave at a gentle heat (I do it in short bursts as it burns very easily!). Spread on top of the tiffin and leave to set, then cut into 16 squares. Perfect with a cup of tea after a good day’s work in the garden!